Ephraim Shores guests will enjoy convenient access to some of Door County’s biggest events this month, highlighted by the Door County Triathlon and a wide range of entertaining festivals. Door County offers something for virtually every interest during the summer, and the July calendar is packed with fun. We offer an ideal location as an Ephraim waterfront resort to make your visit memorable. Seaquist Orchards Farm Market in Sister Bay hosts this fun event on Saturday, July 26. Make your own cheery pie, participate or watch the fun at the pie-eating competition, and enjoy children’s games, pie-baking competition, live music and more great food. Go to http://www.seaquistorchards.com for more information. Lautenbach’s Orchard Country Winery & Market will host this family-friendly event from 10 a.m.-5 p.m. Saturday, July 26. Featuring live music from The Johnson Project, visitors can enjoy free tours, wine and beer tasting, along with artisan booths, food and baked goods. Your family will enjoy picking cherries, horse-drawn wagon rides, face painting, a jumping castle, cherry pit spitting competition and pie-eating contests. 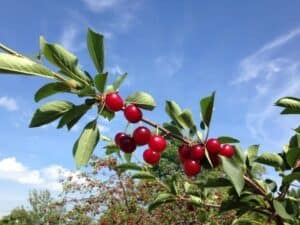 Go to www.orchardcountry.com for more information. Sponsored by the Sister Bay Lions Club to benefit the Leader Dog for the Blind Program, the show features 35 professional dealers along with onsite crystal and china repair. The show will take place 10 a.m.-5 p.m. July 24-26 at Gibraltar High School in Fish Creek. Go to http://www.visitfishcreek.com for more information. Make plans to enjoy the culinary delights of Door County Sept. 6 through Oct. 26. Join us in celebrating the bounty of Door County, along with art, music, attractions and great accommodations such as Ephraim Shores, your Ephraim waterfront resort. Go to this post on Facebook! Post by Ephraim Shores – Door County Waterfront Lodging. 2. Complete the sentence above as a comment on this post and share it with your friends.